Thanks for telling me that! My inventory was getting a bit bloated. No problem! That goes for weapons and armor too - once you Max limit break them, the character gains the weapon passive permanently. Good News: Did some equipment MLB maintenance on Garnet and Beatrix, I now have this awesome (thanks to you guys coming up with it first) team of Garnet EX, MLB everything (cept 15cp for water imperil), and Beatrix EX, MLB everything (cept 35cp, but working on it). It's awesome. Saint's cloth gives 2 buffs to everybody, so that helps Mog Dance start with Mog Dance+ (like I think you guys do with Selphie). Bad News: I just now discovered press-holding on enemies and reading what their moves do and what their resists are etc. Ya, I guess I am a little slow. Ugly News: Try as I may, Edge with Shock is just not pulling it. His evasion-taunt is cool, but Shock, even with Lightning imperil, just really doesn't bring much to the table. He's not MLB anything though, and only 60/57. I will try him again when he's fully finished, but I don't think he'll make the cut. Cait Sith brings so much more to the table. I'm trying out Ramuh, seems like smart thing to do? Bonus: Would Relm-Ramuh be any good here? Alisaie seems like would be good, but Ver Thunder becomes non-lightning move. Lightning herself seems like she might be ok, depending on what her EX does. I don't think I saw any other lightning people (that I own). I guess for water to pair with Garnet in the future would be Faris and Rydia. Edit: Oh, well I just did my biggest single target hit thus far in the game, saw a Climhazard+ hit for 40k. wow. If it helps, I'd been playing the game for a looong time before I realized you could do this lol. You can also press-hold on your team to check their buffs, etc. Yeah, it took me a while to figure out about the press-hold too lol. I had to get a new phone since I completely obliterated the screen of my Samsung A5 lol thankfully I had already logged in the day of destroying it and managed to get my new phone the next day. I should be attempting the EX stages but haven't felt like it. I'll probably give Deuce a try tonight. Nice, can’t even accept it since I’m at full gils. Kefka appears in the second wave. Showed up for me on my third co-op match. Cleared all the coop reward in 2 book, this one was fine but a bit long. 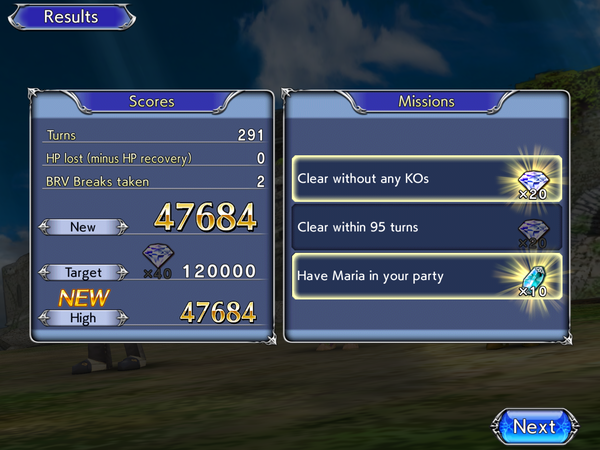 I was the only Galuf the entire time, haha. Not enough appreciation for Galuf it seems. When he’ll cheese the first Cosmos stage, people will realize how good he is. I recently maxed his crystal level recently after finding that Iike his setup and have his 35cp, he’s awesome! The only issue is that if you’re playing co-op, he provides good damage when he actually gets to do his job, but isn’t at his best unless a good support is in the party. Nevertheless, he’s great, and I look forward to him getting more play in the near future! Today will be the first half price (since I tried the game out a second time in November) pull I skip. Combination of my gem supply drying up and the fact that I simply don't care about those 3. Can anybody speak on how good Seven is from experience? I notice she also has Lightning attack for my new fun team, but it would be have to be pretty amazing to take Cait Sith out. Is Thancred good? I just got his EX but I don't know if I should invest in MLBing all his equipment. As of right now he might be the most damaging character in the game because of his rework. What are you guys doing with lucky pulled 2nd EX weapons? 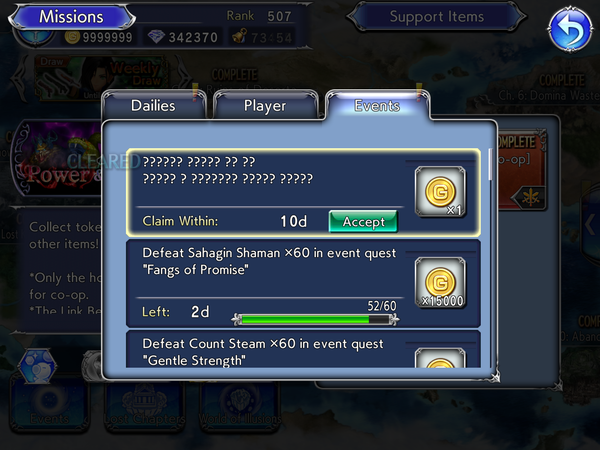 I am personally keeping them until the 7 star EX era for their spheres. Spheres look pretty significant and gives the game some much needed customization skills. EX weapons are easy enough to mlb with power stones anyway from the sold 15 cp and 35 cps. I lucked out and got two Beatrix EX’s when she was up, and I knew by then that you should keep the EX for later, so i’m ready for sphere shenanigans! I kinda really want to pull thancred with tickets, but I don’t have the resources. I’m still good through, because I have a bunch of characters loaded up and ready for their reworks! Anybody have any characters that they are looking forward to using again? Mine’s Y’shtola especially, and the MVP himself, Warrior of Light! Y’sh was my first EX, and I was kinda glad you Only need her EX to make her useful, but I’m seriously waiting for her to get rebalanced to get some good use out of her longevity. Refreshing ability uses and Battery HP+ is no joke! I'll let you know whenever I actually do pull a 2nd EX lol. Definitely Warrior of Light, it helps that I have everything of his MLB. I'm also excited for Serah's reworks. I'm sorry...I've been away from this game for about a month now....what's this about spheres?? Future update (bit under a year away), where we can upgrade EX weapons to EX+. Once those are fully upgraded, they give ya a (one time use) equippable sphere. 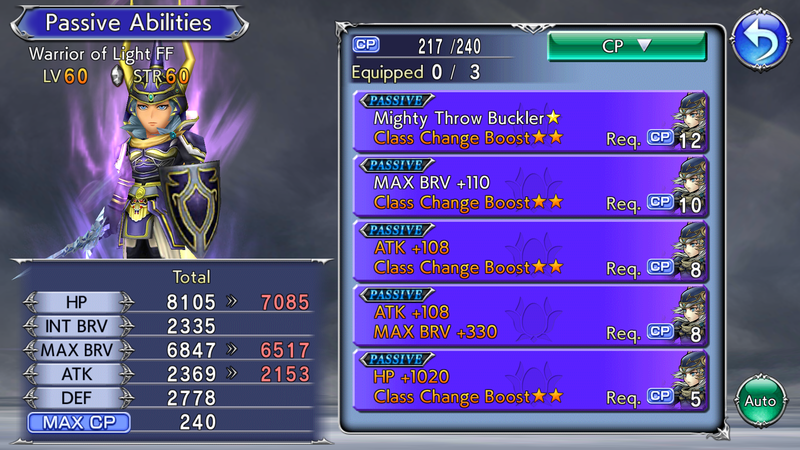 Having lots of duplicate EX weapons...means more spheres assuming you can do the content to get the upgrade items. Chasing Thancred's EX is so tempting right now. He's good even without it but that extra longevity would be nice. I'm hanging onto them (have dupes of WoL's and Ace's). Just couldn't bring myself to power stone an EX, then read not to sell anyway for spheres later on so lucked out there. I’m reading JP players are already having an hard time upgrading all their EX to MLB EX+, so getting spheres out of EX dupe will be very time cash consumming. I’m in love with Galuf’s whole setup now, he’s a ton of fun to use, and the best when he gets to do his thing and dodge-counter physical attacks! He is my second of my favourite off-meta characters so far now, with Fujin, the Instant-Imperiler, as my first! If I put Fujin and Galuf in a party together, what unlikely, underused character do you think could round out the duo? Anyone you don’t care for with Extension is fair game! Well that was absurd. WTF is that EX charge time!? Should be in about 2 months. Solo runs are always a fun watch. HP damage on Finishing Touch will be a godsend! Well and I guess the guaranted paralysis in the following Cross-Slash too. Managed to get Thancred’s EX with single ticket pull, of course I dont have anything else of him. Nice! I'm still far from that with about 3k T3 crystals each, but I still got 30 days for that. Finally completed the Heretics lvl100. Getting 180K was difficult and it took 100+ retries but we got those. This era is not only the current time JP is in, but is also still fairly new. I won't rank them against eachother as a full team of EX+ characters are practically needed for some Chaos fights, so the top 5 are just who have currently impacted JP the most so far. Refer to the gamefaqs post to know why they ranked them that way. I'm glad that many of my favourites are meta at least! Yuna EX when though? 90k gems saved up atm. Not sure when I will pull next.... there's always the possibility of early ex releases. Nice to see some of my favs up there as well, along with a few folks I have MLB'd. Should be in decent shape for the near future. As for the newbies coming up, I'll definitely pull for Agrias; I need Cloud's battle buddy. Plus, she's Agrias Oaks. Quistis though.....does she fall off quickly? 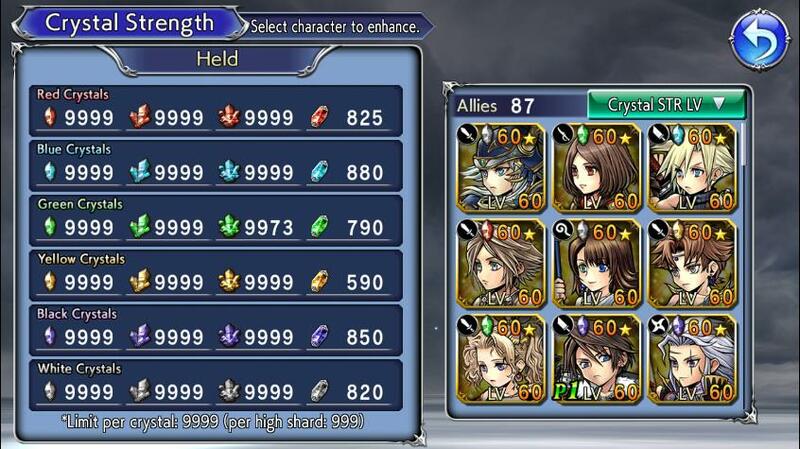 Wondering if I can get by using friend units if needed. Will probably have to pull for Rinoa but I'm thinking I can skip Vayne. 3 tickets used andgot Marias EX. I don't have any other weapons of hers and am not going to spend 5k to try and get others. Ugh. I'm definitely pulling for Rinoa and I'd really like Lenna's EX too, Vayne is also tempting as well as Fran when she arrives with Ashe's EX. It's nice that a good number of my favorite characters are meta. There's also a few where they're not necessarily meta but it'd still be nice to have their weapons since they are a part of my favorites, like Sephiroth and his EX. I think him, Rinoa, and Lenna are the three 'big' EX's that I'll go for in the near future. Yep, the bug is still there. LOL, they didn't fix that, eh? Wish I knew this yesterday. Missed the score mission by 3K, gonna be easy next attempt. I'm so happy at least one of my favourites is in the top 10 for eidoja poll. Sad to see Yuna wont make it though. Terra is the only one I care about in the top 10 atm. At worst I'll aim for 3 of the first and 2 of the latter since we got 5 slots. Eidojas will be nice, I'll do my best to get some good ones for WoL. Woops I forgot about Class Change Boost, we will make the tankiest WoL shield we can. Some of the peeps in the top 10 are head-scratchers, but I'm glad there are a few there that will be helpful. I'll definitely work on gearing up WoL and Cloud for the future, and Vaan and Tidus (if he holds his position) for those times they make a good fit. But come on Thancred!! He has a fight ahead of him but he's fun to play and now's his time to shine.